Alphonsine Plessis came from Normandy. She was the daughter of Marin Plessis, an alcoholic who offered her to men from the age of twelve. When she was sixteen she was a celebrated courtisan in Paris. She had been picked up by the Agénor, the son of Duc de Guiche, who had taken care of her education and turned her into a well mannered lady. By now she called herself Marie Plessis. Her conversation was cultivated, but her lies frequently enraged her lovers. The Duc de Guiche asked her to end her liaison with his son to enable his daughter to marry without scandal. Between September 1844 and August 1845 she was the mistress of Alexandre Dumas fils. They had met at the Palais Royal and in the summer of 1845 they went to St. Germain-en-Laye together. But due to money problems and her infidelity they soon broke up. It is said that shortly after their liaison ended she met Franz Liszt, and that they fell in love with each other. But it's unclear if this has really happened. She certainly did marry Edouard de Perregaux and thus became the Comtesse de Perregaux. In 1847 she sadly died of tuberculosis, only 23 years old. Her tragic story inspired Dumas to write his famous novel "La Dame aux Cemélias" (1848), but there's no certainty that there her admirers really brought white camelias to the funeral because they were her fevourite flowers. At the time of her death Alphonsine owned about 200 books. Among them was "Manon Lescaut", used by Dumas at the start of his novel. 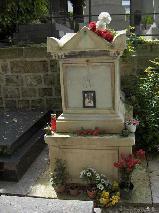 The grave of Alphonsine Plessis at Montmartre Cimetière, Paris.